We’re always told to never underestimate the importance of making a good first impression. It’s advice that applies to all walks of life whether that be for job interviews, becoming engrossed in a good book, or binge watching a Netflix series. It also applies to video games too, and a lesson that Portal Knights could have learned from. It starts harmlessly enough as you create your character, choosing their gender, appearance, and class – whether that be a sword-wielding warrior that can use shouts to strengthen teammates and weaken foes, a ranger that defeats enemies from afar with a bow and can lob bombs, or the mage that can use magic wands, and powerful spells. Once you are done with fussing over their hair, ears, eye shape, and voice, your character is teleported to Squire’s Knoll. It is here that you are taught how to move around, jump, shift items from your backpack to your action bar, gather materials, switch between first and third-person cameras, and lock on to enemies to attack. We’re then loosely taught about crafting, using Blue Portal Stone Shards to create Blue Portal Stones, that, when placed in a damaged portal, will reopen it. It is once you step through this first portal that I felt entirely disconnected from the experience, which, for a game called Portal Knights, is an irony that wasn’t lost on me. Having mentioned material gathering, crafting, and combat, it will be hard for many not to make immediate comparisons between Portal Knights and Minecraft: Nintendo Switch Edition. That’s certainly an audience that developer Keen Games has looked to attract, but, in truth, it exists somewhere between Mojang’s popular sandbox and Dragon Quest Builders. That’s thanks to some the chance to level up your character, earning attribute points to allocate to their constitution, strength, agility, dexterity, wisdom, or intelligence, as well as being able to choose talents, which, for my moustachioed mage, let me initially choose between specialising with staffs, wands, or scythes. More talents become available to you every five levels that you gain, creating the feeling that your character is growing in response to the time that you sink in. But the real problem that I have with Portal Knights is that it is far too rudderless, especially when considering the younger crowd that it is clearly catered to. Once I stepped through that first portal to Dusty Junction, the experience quickly descended into irritation at suddenly finding myself in an area that I was far too under-levelled to be in. With Sand Shells spinning at me, I died to be revived at the Landing Pad only for this to repeat as I sought my revenge. The problem is that there was never any guidance about what I was doing wrong, where I should be going, or if I had missed something. Many will scoff and point to how open-ended design hasn’t dampened enthusiasm for Minecraft: Nintendo Switch Edition, but at least it had a competent tutorial to ground you in everything that you could do in its world. Returning to Squire’s Knoll, I soon stumbled on an old farmhouse to start rebuilding in which I was then prompted to craft some armour. That the developer would let you completely miss something like that speaks volumes to how it doesn’t get the basics right, instead choosing to drown the player in layered gameplay mechanics and leaving you to work everything out. If, as an adult, I struggled with that, then imagine how a younger player would cope – although perhaps they would simply enjoy exploring. That’s not to say that there’s much to do on each island that you visit. Characters that you stumble on will hint at where a treasure chest awaits discovery or ask a generic mediocre request, neither of which ever make you feel like the heroic Portal Knight that you’re meant to be. Even gathering materials is a longer process than it ever needed to be, and there’s no clear instruction on how to unlock new recipes. 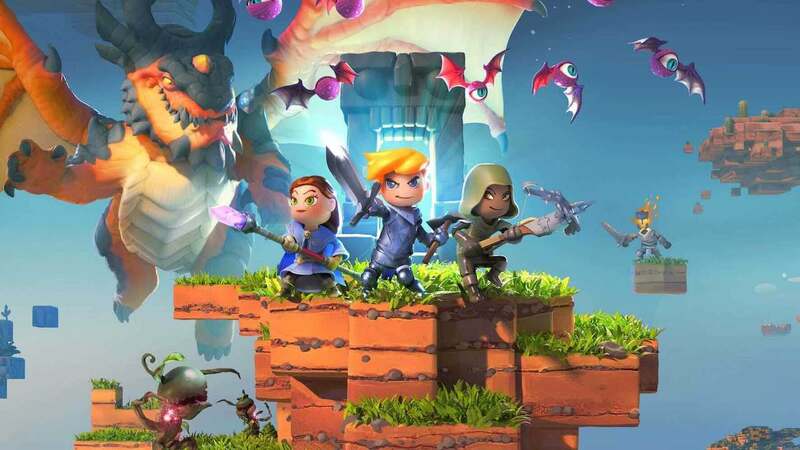 There’s the chance to rally a friend in two-player split-screen, and then there is four-player online or local wireless to team up with more plucky Portal Knights. But, while working cooperatively can bring more laughter and encouragement, it doesn’t change the fact that this has been so unevenly executed. It’s a shame because beneath such striking flaws beats a game with bold ambition that never manages to realise its own potential. There are clear lessons to be learned, then, and it could be said that Portal Knights has tried to achieve far too much at once, rather than nailing the basics and iterating on them. That’s not to say that it doesn’t have its own successes, but some poor design decisions result in a game that will require you to work everything out for yourself before you can become lost in it.